The Underdark eclipses nearly all surface world locations in terms of the sheer power of its magic and its alien and frightening psionics. Who doesn't fear the deity-channeled malice and might of Lolth's clerics? Worse yet are the mind flayers, whose psionic and magical superiority over most other races is as terrifying as their sinister appetites. Less well known, and therefore more mysterious, are the aboleths of the Lowerdark, which harbor secrets of ancient lore within their alien, unfathomable minds. Beyond what is generally known or rumored, the Underdark shelters a wealth of strange power and magic. The long-hidden deep Imaskari still know. spells that leveled kingdoms in ages past. The gloamings and the slyths have abilities that few intelligent creatures (even other Underdark races) understand. And finally, there is the whispered rumor of node magic - a secret lore that allows those with the proper training to channel power from the earth itself. Myriad are the paths to power, as the old archmages like to say, and the Underdark is home to at least as many variant types of magic as the surface world. Circle magic, rune magic, and Shadow Weave magic all have their practitioners in the Realms Below. Cooperative circle magic is favored by the grimlocks of Fingerhome. By combining their magical strength, a handful of spellcasters may accomplish things together that even the most powerful of their fellows could not dream of achieving alone. Rune magic is favored by the duergar, particularly in the Underdark city of Dunspeirrin. And the Shadow Weave - the pattern formed by the negative space between the Weave's strands - is a secretive, shadowy magic that has gained many converts in the Underdark, including the kuo-toa of LoobliShar. Psionics are even more widely practiced in the Realms Below than they are on the surface. The primary practitioners of such powers are the duergar, the illithids, and the aboleths. The Underdark also offers another variant kind of magic that is, for obvious reasons, available only below the earth. This form of power is called node magic. Many parts of the Underdark of Faerûn are suffused with a magical radiation that the drow call faerzress. A remnant of the mighty forces that originally shaped the terrain of the Underdark, faerzress distorts and interferes with certain types of magic. The effects of faerzress on spells are not widely known among surface-dwelling characters. Before a spellcaster attempts a spell that would be affected by the Underdark's magical conditions, a DM may allow the character a DC 25 Knowledge (arcana) or Knowledge (Underdark local) check to determine whether he or she happens to know about the hazards. Areas of faerzress can be found here and there throughout the Underdark. The drow have long sought out places of powerful faerzress in which to raise their cities, since the magical radiation helps to frustrate spying and protect against enemy assaults. The magical energy can also be used in the Construction of various powerful magic items. Faerzress has the following effects. Divinations: Every creature in an area affected by faerzress receives a +4 bonus on Will saves against all divination spells, including scrying and greater scrying spells. Teleportation: Spells of the conjuration (teleportation) subschool do not work reliably over distances greater than 1 mile when either the origin or the destination is within an area affected by faerzress. A character who casts a teleport spell or uses an ability or item that duplicates that effect must make a DC 35 Spellcraft check. Success indicates that the spell works properly; failure means that the teleporting character automatically suffers a mishap, just as if he or she had rolled 100 on the table in the teleport spell description, followed by an "off-target" result. A character using a normally infallible form of teleportation magic (such as word of recall or greater teleport) must also make a DC 25 Spellcraft check. Again, success indicates that the spell works properly, and failure means the character suffers a mishap and an off-target result, as described above. Node magic taps the natural pools and streams of power that collect and run below the earth. This power is not visible to the unpracticed eye, but those with the appropriate sensitivity know that collection points called earth nodes are awash with power that can increase the effects of spells and produce other magical effects. Earth nodes are rare and cherished points in the Underdark, and their discoverers jealously guard the knowledge of them. However, many earth nodes that possess no natural outlet to the greater tunnel systems of the Underdark remain undiscovered, and others are simply unappreciated by the Underdark creatures that live in or near them. The boundaries of an earth node are not visible to the naked eye, but they can be detected. Any creature that comes within 30 feet of the outermost layer of an earth node is entitled to a DC 20 Intelligence check, or a DC 20 Spellcraft check if she has the Node Spellcasting feat. A successful check of either sort reveals the source and direction of a concentration of earth power. Characters with the Node Spellcasting feat recognize this power as an earth node, though they cannot determine its extent, shape, or class without physically mapping it. Earth nodes do not respect tunnel boundaries, mineral deposits, open space, or solid rock. Some lie entirely within cavernous hollows, while others are completely merged with solid earth and stone. One portion of an earth node may lie within a tunnel or cave, while other portions stretch into stone and earth. 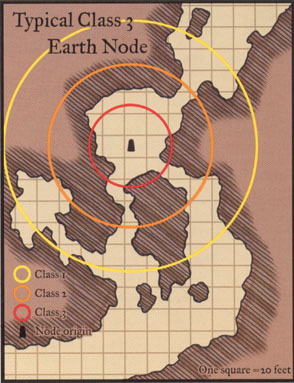 Some earth nodes extend partially or even fully into the surface world. The strength of an earth node is indicated by its class, a number usually between 1 and 5. The higher the number, the more powerful the earth node. Weak earth nodes are far more common than strong ones; half of all earth nodes are Class 1, one-quarter are Class 2, and most of the rest are Class 3 or Class 4. An earth node of Class 2 or higher actually consists of a nested set of shells, or layers, equal in number to its class. For example, a Class 1 earth node has one layer, while a Class 4 node has four layers. Each layer of a node has its own class rating. The innermost shell has the highest rating, equal to that of the entire node. Each additional layer has a class rating 1 point lower than the layer it encases. For example, in a Class 4 node, the innermost Class 4 layer is encased in a Class 3 shell of larger size, which is in turn surrounded by a Class 2 layer, which is surrounded by a Class 1 layer. See Diagram for an example of a Class 3 earth node. The size of an earth node is often, but not always, related to its class, as shown below. Node DC: This value is the base DC for checks made to harness the node's power (see Earth Node Powers, below). Layer Width: This value describes the thickness of each layer in the node. For example, a typical Class 3 node might consist of three layers, each 50 feet wide. Node Diameter: This numerical range represents the overall diameter of the node, from one outermost, edge of its Class 1 shell to the exact opposite edge of the same shell. For example, the Class 3 node mentioned above could be 300 feet in diameter. An earth node's overall class and the class values of its onion-like layers have various implications. Except for the bonus an earth node grants to effective caster level (see below), these powers are available only to a character with the Node Spellcasting feat. A character must be aware of the earth node in order to use any of its powers. Bonus to Effective Caster Level: Any spellcaster can take advantage of this most basic feature of the earth node. A spellcaster standing within an earth node layer can attempt to add its class to the effective caster level of any spell he casts. To succeed, he must make a successful Intelligence check (DC = node's base DC + spell level) while casting the spell. (Making this attempt does not change the spell's casting time.) If the check fails, there is no ill effect - the spell is simply cast at the character's normal caster level, If the check succeeds, the spellcaster adds the layer's class to his caster level for that spell. A character with the Node Spellcasting feat may attempt a Spellcraft check instead of an Intelligence check, at the same DC, for this purpose. A spellcaster may choose to use less of the node's power than is available in order to lower the DC for the check. For example, a spellcaster might choose to add only 2 levels to his effective caster level in the center of a Class 4 node, thereby lowering the DC from 25 + spell level to 11 + spell level. A bonus to effective caster level strengthens spells - some more than others. All effects dependent on caster level (such as caster level checks, damage dice, duration, range, and the like) are calculated according to the new caster level. For instance, if a 5th-level wizard successfully uses node magic to enhance a fireball in the center of a Class 3 node, the spell deals 8d6 points of damage because the spellcaster has an effective caster level of 8th (5th-level wizard + Class 3 node). The bonus to effective caster level does not allow spellcasters to exceed stated damage caps or other spell maximums. A spellcaster using an earth node in this way must make a separate check for each spell so modified. Granted Spells: Earth nodes resonate with certain spells and can make their power available to those who are sensitive to node magic. Each earth node can grant a number of spells equal to its class, with a maximum spell level equal to its class. For instance, a Class 3 earth node can grant three spells of 3rd level or below. A character with the Node Spellcasting feat can access any of a node's granted spells that he is high enough in level to cast normally. To make use of a node-granted spell, the character must stand inside the node and attempt a Spellcraft check (DC same as node's base DC; see above). A character who prepares spells may prepare each of a node's granted spells that she can cast provided that she does so while within the node. No extra spell slots are granted; these spells must be prepared within the character's normal allotment and in the appropriate spell-level slots. The character must succeed on a Spellcraft check for each spell so prepared (see above). Failure indicates that the spellcaster cannot prepare that spell or attempt to prepare any other node spells for 24 hours. Once prepared, the node spell is treated like a normal spell prepared by the character. If the spellcaster leaves the node, she can still cast the spells she prepared there. A spellcaster who does not prepare spells (such as a sorcerer) cannot use a node-granted spell outside the node. As long as he remains within the node, however, he can use the node-granted spell as if it were one of his spells known at the appropriate spell level. No extra spell slots are granted; these spells must be used within the character's normal allotment. The caster must attempt a Spellcraft check each time he tries to use a node spell in this way. (Making this attempt does not change the spell's casting time.) Failure indicates that he cannot use that spell and may not attempt to use any of that node's spells for 24 hours. Below is a table of typical spells an earth node might grant. For important earth nodes, customize the granted spells as you wish. 10+ Class 10+ nodes may exist but have never been detailed. If you are using the rules from the Epic Level Handbook, such nodes do exist, and epic spells resonate with them. If the DM desires, a character with the Node Spellcasting feat may substitute a Knowledge (religion) or a Knowledge(nature) check each time a Spellcraft check is normally called for. This variant allows clerics and druids more access to earth node power. Cache: A character with the Node Spellcasting feat can store items in an earth node so that they are not readily visible, even to those inside the node. A node can accommodate a number of items equal to its earth node class, and no single item may be larger than 10 cubic feet times its earth node class. To store the item, the character must attempt a Spellcraft check (DC same as node's base DC) while standing within the node and touching the item to be stored. Failure indicates that the item is not stored and the character cannot attempt to cache that item again for 24 hours. Attempting to store an item requires a standard action. A character attempting to store an item smaller than the node's maximum volume need not make use of the node's full value. For example, a spellcaster attempting to store an item with a volume of 30 cubic feet in a Class 5 node may choose to make the attempt against a DC of 20 (as though the node were Class 3) instead of 30 (for a Class 1 node), since a Class 3 node has enough capacity to store the object. Stored items disappear, taken up within the earth energy of the node. While stored in this manner, the objects simply cease to exist. If an earth node has reached its storage limit, no one can store new items there. A character attempting to store an item instantly knows whether the earth node is full, although she does not know what items are stored there if she is not the owner. Living or intelligent creatures cannot be stored this way. A character who has stored items in an earth node can retrieve them from any earth node (not just the one she stored them in) by making a Spellcraft check (DC same as DC needed to store the object). Success places the item in the caster's hand (if the object is small enough) or next to the caster on the ground. Attempting to retrieve a cached item requires a standard action. A spellcaster other than the stored item's owner may also attempt to retrieve it, but only within the earth node where the item was originally cached. To retrieve an item stored by another character, the salvager must make a Spellcraft check (DC = node's base DC + caster level of the original owner). Success indicates that one of the original owner's items cached there (determined randomly) appears next to the salvager. Characters capable of using node magic can modify earth nodes in a variety of ways. For example, such a character could customize a living space, or create a temple to a particular deity (or ideal, or fiend), or open up an earth node that is completely coexistent with solid rock, or make any other physical modification of the node's space. Customization must be done by the appropriate physical means and takes the same amount of time that such a project normally takes. Ensuring that the node remains magically intact during the process requires a successful Spellcraft check (DC = node's base DC + 10) by an overseeing character with the Node Spellcasting feat when the customization is complete (or after each week of an ongoing customization project). This check represents the character's attempt to mentally smooth and reroute the earth flows in light of the new physical configuration. Each unsuccessful check permanently reduces the node's class by 1. Psionic characters can also benefit from the discovery of earth nodes, though some of the advantages they gain are different. The feats and node-granted abilities below may be replaced by the indicated psionic versions for use by psionic characters created using the Psionics Handbook. Node Spellcasting Feat: Node Manifestation feat (Prerequisite: Manifester level 1st). This feat allows a psionic character to use earth nodes to full capacity. Node Store Feat: Node Power feat (Prerequisites: Node Manifestation, manifester level 1st). The manifester chooses two powers. While in an earth node, he can freely manifest each of these powers one extra time per day. Metanode Spell Feat: Metanode Power feat (Prerequisites: Node Manifestation, manifester level 1st). While the manifester is in an earth node, his metapsionic power bump point costs are lowered by an amount equal to the class of the earth node layer he inhabits x2. Bonus to Effective Caster Level: Psionic characters treat the earth node as a crystal capacitor with a storage potential equal to the node's class. Characters With the Node Manifestation feat treat the earth node as a crystal capacitor with a storage potential equal to the node's class x2. Psionic characters must remain in the node to access these power points. The earth node grants these power points each day to a maximum number of psionic characters equal to its earth node class. The node does not need to recharge like a standard crystal capacitor does. Granted Spells: Granted Powers. A psionic character with the Node Manifestation feat gains access to a list of powers whose functions mirror those of the spells that the node can grant to spellcasters. Cache: Psionic Cache. A psionic character with the Node Manifestation feat can cache items in the same way as spellcasters can, except that a Psicraft check is required instead of a Spellcraft check.